A clinician’s ability to diagnose accurately is central in assessing prognosis and prescribing effective treatments. However, the strategies clinicians use to arrive at a diagnosis, particularly in primary care, make only a small contribution to current research and the medical curriculum.1 Seminal research in the 1970s showed that the commonly taught sequential approach to history taking and examination, resulting in differential diagnosis and ultimately a final diagnosis, is not what practitioners do in reality.2 3 Researchers observed that diagnostic hypotheses are made early in the consultation and guide subsequent history and examination, in a process of hypothetico-deductive reasoning.2 This work sparked debate about our understanding of the complex strategies used in diagnostic reasoning,4 5 but most work has been done away from the clinical setting. This series of articles aims to set out the strategies and methods that are used by general practitioners (GPs) in routine clinical consultations. To check that these strategies were actually used in practice, we conducted a pilot of diagnostic consultations from our own practices (box). We conducted two sessions of group discussion and a prospective evaluation of these strategies during primary care consultations. In the pilot phase, a focus group composed of GPs and researchers in primary health care identified several possible diagnostic strategies, based on consensus opinion and the published literature. Use of these strategies was assessed in a consecutive series of 100 patients presenting with a new condition to one GP (CH). Strategies were recorded on a spreadsheet at the end of each consultation. The group of GPs then discussed these pilot results, and revised and refined the set of strategies. We revised the data collection sheet and asked six GPs to record their diagnostic strategies for 50 new patients at the end of each consultation. The GPs were two partners (27 and 16 years’ clinical experience), two registrars (8 and 4 years’ experience), one part time assistant (29 years’ experience), and one locum (7 years’ experience). At a final focus session, the six GPs and one statistician reviewed data from these 300 consultations, using a consensus development approach,6 and clarified definitions used for the diagnostic strategies. 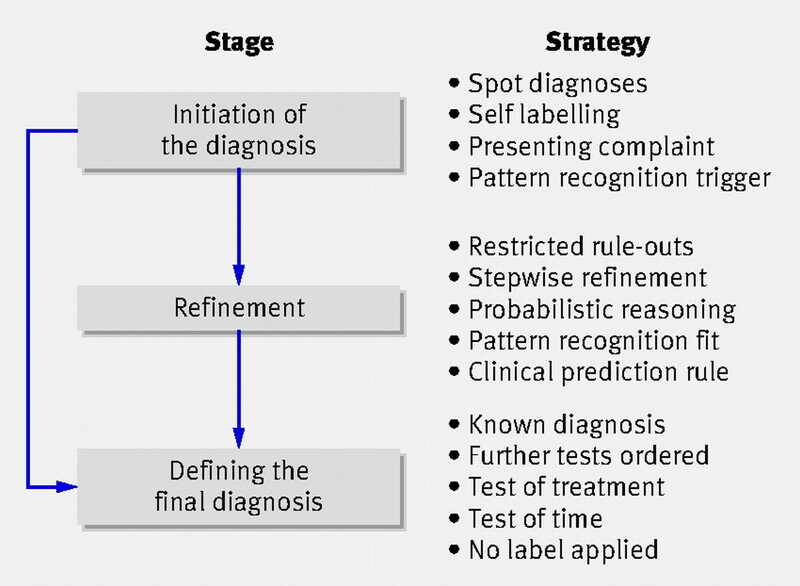 We found that diagnostic reasoning can be split into a three stage model: initiation of diagnostic hypotheses; refinement of the diagnostic hypotheses; and defining the final diagnosis (fig 1)⇓. Different strategies are used in each stage. For example, the initial complaint, “spot” diagnosis (initial response), or pattern may trigger the possible diagnoses (hypotheses); then, specific elements of history or examination are elicited to rule in or rule out competing possibilities; finally, one or several strategies may be used to confirm the final diagnosis—for example, trial of treatment, test of time, or a definitive test. More than one element may be considered during each stage. For instance, some rashes can be diagnosed with a visual spot diagnosis, while for others, spot diagnosis may be part of an overall pattern recognition strategy with probabilistic reasoning—for example, a characteristic chicken pox rash in a child with a fever. In addition, for some diagnoses a high level of certainty at the initiation stage may lead straight to a final known diagnosis, missing out the refinement step—for example, diagnosing simple acne. The first trigger for a diagnosis usually occurs early in the consultation.3 We identified four possible strategies: spot diagnosis, self labelling, the presenting complaint, and pattern recognition trigger (fig 2)⇓. “Spot” diagnosis arises from an unconscious recognition of a particular non-verbal pattern, usually visual (dermatological condition such as acne) or auditory (a barking cough). The spot diagnosis is almost instantaneous, relies on previous non-verbal experience of the condition, and does not require further history from the patient to trigger the possible diagnosis. Many consider a spot diagnoses as basically pattern recognition, and Sackett et al referred to spot diagnosis as the “Auntie Minnie” phenomenon: instant recognition of a relative, so that a stranger is not greeted by a hearty slap on the back.7 It seems that the main determinant in the use of spot diagnosis is clinical experience with a given condition.8 9 Examples in our series included eczema, moles, acne, molluscum, and infective conjunctivitis. Spot diagnosis was used in about 20% of cases, and for 63% of these, no further diagnostic strategy was used. 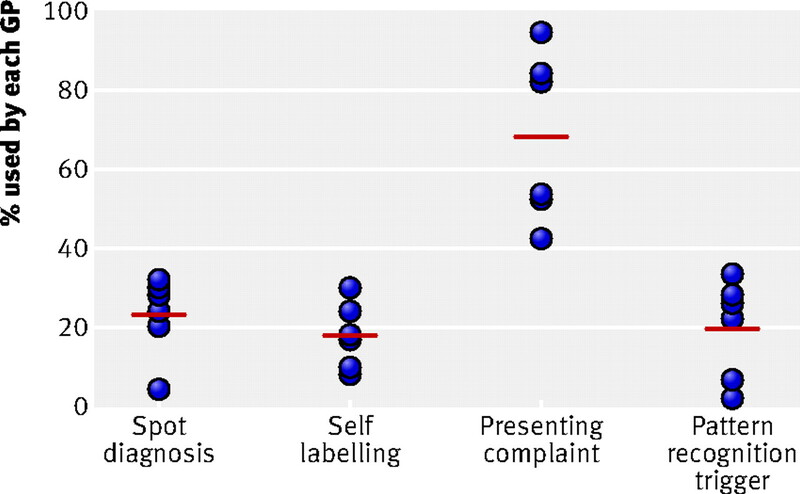 Self labelling—The patient may tell you what they perceive to be the diagnosis. This may or may not be correct, and is often based on their own or an acquaintance’s previous experience of a problem, but it immediately directs subsequent refinement of the diagnosis. An example in our series was “I have tonsillitis.” In some conditions, but not all, self labelling can be accurate: a study of women with recurrent urinary tract infection showed that 84% of new infections (confirmed by culture) were correctly self diagnosed.10 In our prospective evaluation, cases such as gout and chest infection were mislabelled by patients. Presenting complaint (for instance, “I have abdominal pain” or “I have a headache”) was used most often by our GPs (fig 2⇑), and traditional textbooks and teaching recognise this step at the outset of the consultation. Pattern recognition trigger—Elements in the history or examination, or both (sometimes related to the presenting complaint) may trigger the hypothesis. For example, thirst, feeling unwell, and looking unwell in an adolescent triggers the possibility of type 1 diabetes. Once the initial possible diagnoses are formed, other strategies are used to narrow the possibilities. These strategies are not mutually exclusive. 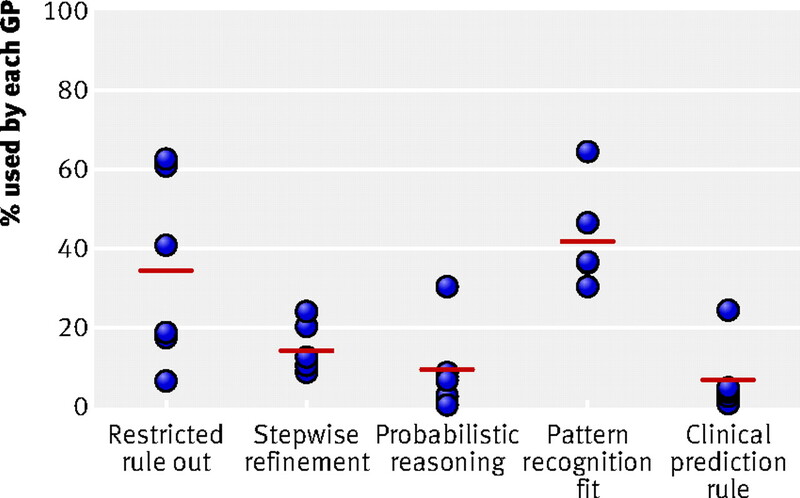 We found that five strategies were used in the refinement stage: restricted rule out process, stepwise refinement, probabilistic reasoning, pattern fit, and clinical prediction rule (fig 3)⇓. Stepwise refinement is based on either the anatomical location of the problem or the putative underlying pathological process. Arm pain might be further refined to the wrist and then to the radial side of the wrist, for example in diagnosing deQuervain’s tenosynovitis. An example of refinement based on the underlying disease is deciding whether conjunctivitis is allergic or infectious. Probabilistic reasoning is the specific but probably imperfect use of symptoms, signs, or diagnostic tests to rule in or rule out a diagnosis. Probabilistic reasoning requires knowing the degree to which a positive or negative result of a test adjusts the probability of a given disease.13 Examples include the examination of the temporal artery in the diagnosis of temporal arteritis, use of urinary dipstick in urinary tract infections, and use of electrocardiograms in the assessment of chest pain. Pattern recognition fit—symptoms and signs are compared to previous patterns or cases, and a disease is recognised when the actual pattern fits. This is the refinement strategy most commonly used by GPs (fig 2⇑). Its use relies on memory of known patterns, but no specific rule is used. Some conditions may have various patterns—for example, acute myocardial infarction. Clinical prediction rule is a formal version of pattern recognition based on a well defined and widely validated series of similar cases. The GPs used the Ottawa ankle rules,14 streptococcal sore throat rules,15 ABCD score for stroke risk,16 HAD score for depression,17 Wells rule for deep vein thrombosis,18 and chest infection rules.19 20 Which rules are useful and how they can best be used in practice remains an important unanswered question. Less than 50% of cases resulted in the certainty of a “known diagnosis” without further testing. Thus GPs use other strategies in the final stage of diagnosis, including ordering further tests, test of treatment, and test of time. In some cases the final diagnosis could not be given a label (fig 4)⇓. Ordering further tests—a standard test can sometimes be used to rule in or rule out the disease—for example, midstream urine (MSU) in urinary tract infection. In addition, further tests were used in response to “red flags” and when the diagnoses did not fit any obvious pattern of disease. Test of treatment—when the diagnosis is uncertain, the response to treatment is often used to refute or confirm it. Examples included the use of inhalers in nocturnal cough. Test of time—the course of the disease is used to predict when a person should be better or worse; a “wait and see” strategy allows the diagnosis to become more obvious. For example, in a patient with abdominal pain, diarrhoea, and no red flags, and who is diagnosed as having viral gastroenteritis, most GPs would wait one or two weeks before considering other disease or testing. No label applied—where no diagnostic label could be assigned to the patient, presentations were often vague and didn’t fit a recognisable pattern. Various strategies can be used: recalling the patient for further review, using an exploratory investigation, sharing uncertainty with the patient, or referral to secondary care for a second opinion. Red flags are specific symptoms or signs that may be volunteered by the patient (central crushing chest pain, for example) or may need to be elicited in the history or examination to rule out a serious condition (for example, checking for neck stiffness in a patient with headache to rule out meningitis). If the symptom or sign cannot be ruled out, it triggers action, which can range from a more detailed physical examination to hospital referral. Murtagh’s restricted rule out process proved the most controversial of the definitions. Some GPs used a cognitive forcing strategy, whereby plausible alternative diagnoses were not considered once a diagnosis had been reached (a common cause of diagnostic error).23 Others were unaware of or avoided this strategy. Few GPs formally recognised their use of probabilistic reasoning. 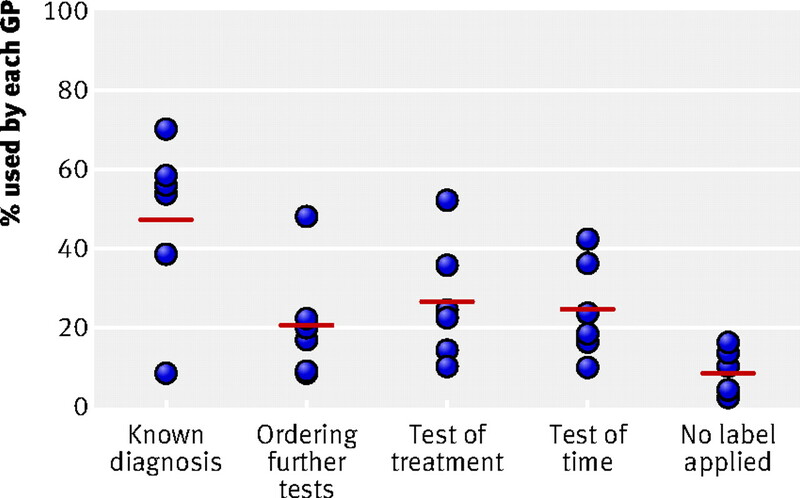 This is in line with previous studies which indicate most practising physicians do not use formal recommended quantitative methods.24 For the final diagnosis, tests of treatment and time were used on average for a quarter of consultations, despite there being a poor evidence base informing this process. The data we present have limitations: we cannot tell whether the difference in the use of strategies results from the case mix or the doctors. Both probably are a factor, with cases varying more than the individual GP’s use of a given strategy. In addition, selective bias in the reporting of strategies may result from using the collection sheets and recall. During consultations the GPs tended to record the main problem only, leading to a selective under-reporting of secondary problems.25 Thus the doctors in our study may have under-reported using a second or third strategy. None of the diagnostic strategies discussed here is new. What is new is the formal recognition of these strategies in the stages of making a diagnosis and how commonly they are used in primary care. Expertise in diagnosis is not a matter of acquiring an all-inclusive reasoning strategy, as several strategies may lead to the same diagnosis. The recognition of the strategies in all medical practice should encourage the use of experience to guide our search for the correct diagnosis.26 Throughout this series we will illustrate the principles presented here with a number of clinical presentations, expanding on the reasoning and the justification for these diagnostic strategies. We thank Arthur Elstein for his comments on this manuscript. Contributors: CH and PG conceived the original idea for the diagnostic strategies used in primary care and planned the initial project. CH undertook the preliminary data collection and CH, PG, MT, PR, DL, and CS collected the second set of consultation data. RP checked the integrity of the data and the analysis. CH, PG, JB, and MT wrote the initial draft and all authors contributed to the focus sessions to clarify the definitions and approve the final draft. CH is guarantor. This series has received financial support from a National Institute of Health Research (NIHR) programme grant: Development and implementation of new diagnostic processes in primary care. The Department of Primary Health Care is part of the NIHR school of primary care research, which provides financial support for senior staff who contributed to this paper. Wilson T, Pringle M, Sheikh A. Promoting patient safety in primary care. BMJ2001;323:583-4. Elstein AS, Kagan N, Shulman LS, Jason H, Loupe MJ. Methods and theory in the study of medical inquiry. J Med Educ1972;47:85-92. Elstein AS, Shulman LS, Sprafka SA. Medical problem-solving. J Med Educ1981;56:75-6. Bowen JL. Educational strategies to promote clinical diagnostic reasoning. N Engl J Med2006;355:2217-25. Schmidt HG, Norman GR, Boshuizen HP. A cognitive perspective on medical expertise: theory and implication. Acad Med1990;65:611-21. Sackett DL, Haynes RB, Tugwell P. Clinical epidemiolgy. 1st ed. Boston: Little Brown, 1995. Balint GP, Buchanan WW, Dequeker J. A brief history of medical taxonomy and diagnosis. Clin Rheumatol2006;25:132-5. Brooks LR, Norman GR, Allen SW. Role of specific similarity in a medical diagnostic task. J Exp Psychol Gen1991;120:278-87. Gupta K, Hooton TM, Roberts PL, Stamm WE. Patient-initiated treatment of uncomplicated recurrent urinary tract infections in young women. Ann Intern Med2001;135:9-16. Murtagh J. Common problems: a safe diagnostic strategy. Aust Fam Physician1990;19(5):733-2. Croskerry P. Cognitive forcing strategies in clinical decisionmaking. Ann Emerg Med2003;41:110-20. Richardson WS. We should overcome the barriers to evidence-based clinical diagnosis! J Clin Epidemiol2007;60:217-27. Bachmann LM, Kolb E, Koller MT, Steurer J, ter Riet G. Accuracy of Ottawa ankle rules to exclude fractures of the ankle and mid-foot: systematic review. BMJ2003;326:417. Ebell MH, Smith MA, Barry HC, Ives K, Carey M. The rational clinical examination. Does this patient have strep throat? JAMA2000;284:2912-8. Rothwell PM, Giles MF, Flossmann E, Lovelock CE, Redgrave JN, Warlow CP, et al. A simple score (ABCD) to identify individuals at high early risk of stroke after transient ischaemic attack. Lancet2005;366:29-36. Bjelland I, Dahl AA, Haug TT, Neckelmann D. The validity of the hospital anxiety and depression scale: an updated literature review. J Psychosom Res2002;52:69-77. Segal JB, Eng J, Tamariz LJ, Bass EB. Review of the evidence on diagnosis of deep venous thrombosis and pulmonary embolism. Ann Fam Med2007;5:63-73. Margolis P, Gadomski A. The rational clinical examination. Does this infant have pneumonia? JAMA1998;279:308-13. Metlay JP, Kapoor WN, Fine MJ. Does this patient have community-acquired pneumonia? Diagnosing pneumonia by history and physical examination. JAMA1997;278:1440-5. Myocardial infarction redefined—a consensus document of The Joint European Society of Cardiology/American College of Cardiology Committee for the redefinition of myocardial infarction. Eur Heart J2000;21:1502-13. Rose PW, Harnden A, Brueggemann AB, Perera R, Sheikh A, Crook D, et al. Chloramphenicol treatment for acute infective conjunctivitis in children in primary care: a randomised double-blind placebo-controlled trial. Lancet2005;366:37-43. Levy PD, Sherwin RL, Kuhn GJ. Clinical diagnostic reasoning. N Engl J Med2007;356:1272-4. Reid MC, Lane DA, Feinstein AR. Academic calculations versus clinical judgments: practicing physicians’ use of quantitative measures of test accuracy. Am J Med1998;104:374-80. Britt H, Meza RA, Del MC. Methodology of morbidity and treatment data collection in general practice in Australia: a comparison of two methods. Fam Pract1996;13:462-7. Norman G. Building on experience—the development of clinical reasoning. N Engl J Med2006;355:2251-2.